There's something truly special, as a mother, about taking your daughter to the ballet. And for CC's first visit, she got to experience a magical one -- the Joffrey Ballet's production of "Cinderella" at the Dorothy Chandler Pavilion. As an added bonus, she was even complimented on her behavior by the brave woman sitting next to us last night. "She was wonderful," the woman remarked multiple times. And she was. For a toddler who had stayed up way past her bedtime, CC was engaged, wowed, a little scared at the beginning (dark rooms and ugly stepsisters can do that sometimes), but her eyes rarely left the stage. "Where's Cinderella?" she asked when the title character was in the wings. "Where's the fairy godmother?" Her eyes even lit up when the working coach arrived on stage. It was great to see. Kudos to the production for that. Sir Frederick Ashton's "Cinderella" as a ballet, with a score from Sergei Prokiev, is gorgeous and visually stunning, particularly the scenes during the ball. Not only is the stage transformed into a golden royal palace, but Cinderella's grand entrance (played by Victoria Jaiani, in the above photo) is breathtaking. The first act features the bumbling, gender-bending stepsisters -- who were played by men (David Gombert, Michael Smith), a clever touch by the company. They were large, appropriately self-centered, and fun to watch. The jester (Derrick Agnoletti) was another highlight. There were ooh's and ahh's from the people around us, as he bounced in the air, his legs stretched straight out. It was as if he had his own invisible trampoline. The fairy godmother and her attendant fairies and stars were also lovely. But the stunner was Cinderella. As she danced with her prince, her toes pointed onto the stage, Jaiani reminded the audience of -- and introduced CC to -- the grace and craft that is the magic of ballet. Friday, Jan. 29 – 7:30 p.m.
Saturday, Jan. 30 – 2:00 p.m. and 7:30 p.m.
Sunday, Jan. 31– 2:00 p.m. The Princess Project is accepting new or "nearly new" formal dresses and accessories in the Music Center Plaza during the production of "Cinderella." According to the Music Center Web site: "The Princess Project, along with representatives from The Glass Slipper Project, will be on hand to collect donations that will be distributed to high school girls who could not otherwise afford their own formal prom attire. Donations are open to the public, there are no costs to donate and no need to have a performance ticket to participate." Gustafer Yellowgold, that Earth-loving creature from the sun who's made quite an impression on the children's music scene, will be making his way to McCabe's Guitar Shop in Santa Monica on Feb. 7. Actually, he and his other animated friends -- a pterodactyl named Forrest Applecrumbie, an eel called Slim and Asparagus the dragon, among others -- will appear on screen as his creator, illustrator/songwriter Morgan Taylor, and other musicians offer up tunes on his behalf. If you're not yet familiar with Gustafer's world, it's a very charming and mellow one -- hence his latest DVD/CD collection "Gustafer Yellowgold's Mellow Fever," which hit shelves last March. Gustafer is a little guy from the sun who left his family to explore the chillier environs of Minnesota. Once there -- he arrived via sunpod -- he met up with other animal pals. CC and I had the opportunity to check out "Mellow Fever." The songs themselves aren't your average sugar-shock dose of kid rock. Instead, they're more thoughtful, definitely softer in tone and sometimes have hints of melancholy. In fact, "Butter Pond Lake" tackles the subject of missing home and family. Talking to Ohio native Morgan Taylor on his way back from a show in Atlanta to his family's home in the Catskill Mountains, he told me he'd "always been a cartoonist" and began drawing Gustafer "before I knew who he was." Morgan also wrote songs, "all in the first person, all in the fictitious realm." All of a sudden it clicked. 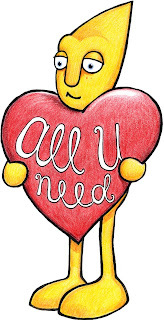 This pointy-headed yellow guy, as he called him, was the character that connected his illustrations to the music. "It was a wonderful accident that initiated the whole thing," he added. The company behind Gustafer, Apple-Eye Productions, is made up of Morgan and his wife, singer/songwriter Rachel Loshak. They also have a young addition to the crew, their 22-month-old son, Harvey. Their music, Morgan said, is like a "comfort blanket" for Harvey. "He really loves Gustafer's music. We never gave Harvey a pacifier, so Gustafer's music is his pacifier," he added. That definitely helps out on the road, he said, where they travel everywhere together -- by car as well as by plane. "It's nice to be able to be together, for Harvey to have full access to both of his parents," Morgan said. "That's rare, especially as a dad to be around my son so much." Sunday, Feb. 7; 11 a.m. When I first heard that BabyCakes NYC was opening in downtown Los Angeles, I didn't suffer from the local foodie's lament that we're already overrun with cupcake joints -- what with Sprinkles, Joan's on Third, Toast and Crumbs, among others, vying to be the tastiest cake in town. No, I was grateful. I actually never tire of anything with "cake" in the name. Then I heard it was vegan. "Refined sugar-free, gluten-free, wheat-free, soy-free, casein-free and egg-free" to be exact. But then I tasted one of BabyCakes' cupcakes -- actually I had CC try hers first (some mother I am!) -- and I was totally smitten. I ordered chocolate with chocolate frosting (CC went for carrot, that little health nut), and I was expecting something dry and aggressively "good for you." But this normal-sized (not as big as your head), moist, chocolaty cupcake delivered on all the sweet-tooth necessities -- the frosting was thick, smooth, but not too sweet, and the cake itself was bold and flavorful. And whatever casein is, I didn't miss it. Neither did CC. She almost didn't even let me taste her carrot cupcake, but then she relented, thank God. BabyCakes is the brain child of Erin McKenna, who launched the first outpost in New York. According to the Web site, she wanted to cater to those with "persnickety diets" who can often "feel left out." The shop also offers cakes, cookies, cookie sandwiches, donuts, muffins and scones. Yes, we'll have to go back. Not only for the goodies, but also for the Manhattan-like feel of the place. It's cozy, right in the heart of downtown at 6th and Los Angeles Streets, on the bottom floor of the Pacific Electric building. There are converted lofts and an art gallery across the street and a taste of gentrified downtown grit. Kinda like New York. Peter Kors, Heather Calvete and Linda Zoolalian perform "Opera Cat." Some libraries make their books come alive -- others actually make them sing. That's what happened downtown this weekend at the Los Angeles Central Library during its "Performing Books" presentation of "Opera Cat," by Tess Weaver. The free and family-friendly program offers live performances of music-themed children's books, and this month's selection gave kiddos the chance to hear a real diva -- opera singer Heather Calvete. 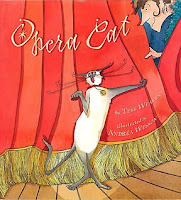 "Opera Cat" tells the story of a singing feline named Alma who loves the opera and fills in for her owner, Madame SoSo, after she loses her voice. While storyteller Peter Kors read the text, Heather acted out the parts of Alma and Mme. SoSo as the book's illustrations appeared on screen and Linda Zoolalian accompanied on piano. CC was riveted, as were most of the children in the audience. The storytelling was lively and animated, and the music was an absolutely lovely touch. Nothing too heavy and just enough to keep the kids' interest piqued. After the show, the performers all took questions from the child-heavy audience. Most of the kids wanted to know when the trio got started with their craft. 5 1/2 for Linda all the way up to 19 for Peter, who said he became a performer "to impress a girl." CC kept turning to me and saying, "It's my turn!" She didn't necessarily have a question. She just wanted to be heard. What we did get was a (blurry) photo of her with the performers. That, and a great time at the library. For more information on "Performing Books," visit the Los Angeles Public Library website. With all this talk of volunteering, I thought I'd include the recently announced offer from Disneyland -- "Give a Day. 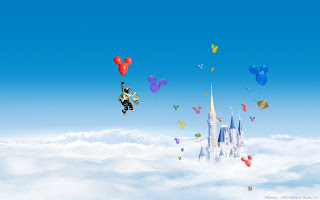 Get a Disney Day." The program, which kicked off this month and runs through Dec. 15, offers a free one-day, one-theme park ticket to Disneyland or Walt Disney World to people who volunteer a day of service at participating organizations in their community. Unfortunately, for CC, kids must be at least 6 years old to participate. ... But maybe Ian and I could get a babysitter and play hooky ourselves. Shh, don't tell CC I said that. 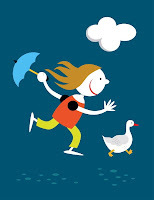 As Los Angeles continues to endure Storm Watch 2010 -- which should ease up a little bit this weekend, if forecasts are correct -- parents are asking what they can do with their kids on these gray, rainy days. * The Boone Children's Gallery at LACMA (free) -- Kids can paint, read and learn about Korean art in this tyke-friendly art room inside the Los Angeles County Museum of Art. Friendly attendants are on hand to help out. CC and I visited in October and had a great time. * Noah's Ark at The Skirball (free on Thursdays) -- This whimsical and interactive exhibit at The Skirball Cultural Center is great for kids who enjoy animals and love to climb. The larger-than-life ark houses rope mazes, creative critters as well as art activities for the little ones. CC wants to go again. * The Treehouse Social Club ($9/child for Open Play) -- Children can avoid the rain but still burn off some energy at The Treehouse Social Club. Not only is there a large, indoor treehouse, complete with a superfast slide, there's also a toddler room with toys and a cafe, where parents can enjoy coffee or hot chocolate. CC gave it a big thumbs up! * AdventurePlex (under 3 years: $5; 3+ years: $10) -- This huge play space in Manhattan Beach is a great option for kids who want to release their inner monkey. CC ditched me for the two-plus-story Adventure Room, which is simply amazing. * Under the Sea ($9/child for Open Play) -- Kids can bounce in bounce houses, ride in child-size cars and slide for hours in this ocean-themed play space. CC loved having a variety of activities on offer. * Moviefone.com offers info on what's playing in your neighborhood. Sometimes hanging out in front of a big screen with popcorn and a drink is the best way to enjoy a rainy day. * Addresses are located in the links provided. The Joffrey Ballet is bringing its production of "Cinderella" to the Dorothy Chandler Pavilion Jan. 28-31, and I couldn't be happier. Right now, CC is going through her Cinderella phase, so I have to applaud the company's timing. 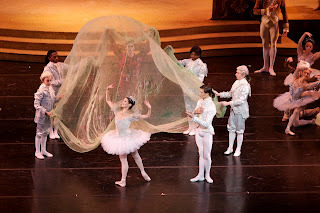 The convergence of CC's enthusiasm with the renowned ballet company and a kid-friendly, classic story is overshadowed only by the thrill it will give me to introduce my daughter to an art form she has never seen, with a presentation that should be both accessible and captivating. 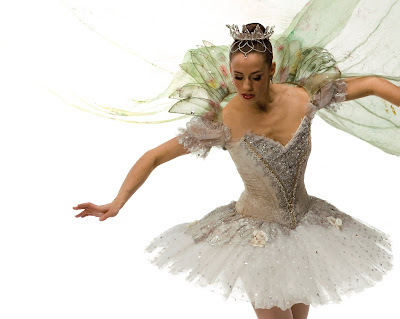 "The classic story ballet 'Cinderella,' performed in three acts in just over two hours, follows the title character as she grows from a sad, young woman into a beautiful princess with the help of her Fairy Godmother. After receiving gifts from the Fairies of the Four Seasons, she is whisked away in a coach to meet her handsome prince at the ball. With a cast of 50 dancers, over 20 children from local ballet schools, breathtaking costumes and sets with a working 'coach' all designed by David Walker and acquired in mint condition from the Dutch National Ballet, this $1 million presentation of “Cinderella” becomes The Joffrey Ballet’s most sizeable production to date." "Cinderella," with choreography by Sir Frederick Ashton and music by Serge Prokiev, is part of the 2009-10 season of Glorya Kaufman Presents Dance at the Music Center. Thursday, Jan. 28 – 7:30 p.m.
With Martin Luther King Jr. Day comes a certain amount of hopeful expectation -- expectation that ranges from more tolerance to more community volunteers. After all, this day also calls all Americans to a National Day of Service in his honor. Although there is great need within the United States, no doubt, there is also dire and imminent need in Haiti, after the tragic earthquake that struck the island nation on Jan. 12. Luckily, our community of greater Los Angeles -- along with the U.S. in general -- is rising to meet that need. But I wanted to get CC involved, too. So this morning we visited a local grocery store and bought items such as pasta, milk powder, peanut butter and cooking oil, all of which will go to the ANA Children's Center and Brebis de Saint Michelle Orphanage (BRESMA) in Port-au-Prince. This has been organized by Lime Studios in Santa Monica. I'm all for my child learning how to give back to other children in need, and this is one way for her to help. Please visit the Lime-Aid website for a list of the 10 items they're collecting as well as drop-off locations around the city. LA Moms Blog: Too busy blogging? Well, I did end up writing about that embarrassing anecdote I mentioned in my last post. Please check out my latest LA Moms Blog post: Don't bother me, honey. I'm too busy blogging about you. On Wednesday, I had the opportunity to visit the PBS portion of the Television Critics Association Press Tour in Pasadena. Besides getting a glimpse into PBS' upcoming spring lineup -- which has a lot of amazing stuff on tap (more on that in a later post) -- I was also able to chat with Frontline producer Rachel Dretzin and correspondent Douglas Rushkoff over lunch with a group of Los Angeles mom bloggers. Our subject: kids and technology. Specifically, "Frontline: Digital Nation," which will air Feb. 2 at 9 p.m. on PBS. "Digital Nation" is both a Web-based project as well as a broadcast (set your DVRs, Losties!) focusing on how we exist in a Facebook-obsessed, texting-heavy, Twitter-loving, remote-control world. "How does techno logy affect the way you live?" they ask. Depending on how digitally friendly you are, you might or might not be surprised. "In the online vs. physical space, a little less has become acceptable," Dretzin said in the general press conference. "A little less eye contact. A little less attention." What we talked about over lunch was how we as mothers approach technology and our kids. Some moms are a little leery of Facebook and how much private information is exposed online. For moms of little ones, like myself, we worry about how early is too early to expose toddlers to online games, computers, video games and the like. In fact, I revealed one embarrassing anecdote, which might or might not turn into an LA Moms Blog post. A few weeks ago, I was blogging when CC came up to me to ask me something (probably to play). Instead of dropping everything, I said, "Wait just a minute, Sweetheart. Mommy's on the computer." Of course, I was blogging about her. The irony of not playing with my child so I could blog about her was a little insane. We seem to have a love-hate relationship with technology. Does it help or hinder communication? Are we more or less focused? Are we closer or further away from the people who matter most? Sometimes it's amazing just to peek in on CC while she's sleeping -- especially when she's decided to dress herself in a closet full of clothes before she hits the sack. On Saturday, CC got her first-ever taste of snow -- in Southern California, in 75 degree weather. Culver City hosted a Winter Wonderland at Veterans' Memorial Park to celebrate its new play space (with special thanks to The Wasserman Foundation and KaBoom! ), and the city trucked in heaps and heaps of snow for the occasion. CC has seen snow in theory -- on TV, in the movies -- but I wasn't sure how she would respond to the real stuff. Turns out she's a pro, even as a 3-year-old newbie. The first thing she did? Lie down in the middle of the cold white stuff and make a snow angel. Rebecca Romijn unveils her new "got milk?" ad. Got milk mustaches? Rebecca Romijn and her daughters do. Yesterday, CC and I had the chance to swing by the new "got milk?" campaign launch at the W Los Angeles Hotel in Westwood. Adding some star power -- and mom power, too -- the nation's milk processors teamed with model/actress Rebecca Romijn and her 1-year-old twin daughters to be the faces of the 2010 National Milk Mustache Campaign ad, which encourages mothers to "make milk a priority in the year ahead." Rebecca, who really is that tall and, of course, gorgeous, was on hand with her husband, actor Jerry O'Connell, but without babies in tow. Too bad -- they look adorable. She reiterated what she mentioned in a statement, saying, "(Milk) supplies so many nutrients that are important for my children's development -- and to my overall health, too." The event, held in The Backyard of the W, was really kid-friendly and included Lego stations, an area for the tykes to plant herbs and vegetables (right), a super-cool synthetic ice rink (no ice needed!) and tons of milk, natch. Chocolate, strawberry, 1%, you name it. CC and I even got to take our own "Milk Mustache" photo! CC was so focused on the milk, however, that when I ran into Jerry O'Connell and asked for a pic (left), she barely cracked a smile. The kid had her priorities. The National Milk Mustache "got milk?" Campaign also launched the "Great Gallon Give" program, which, according to the press release, "will give away hundreds of thousands of gallons of milk -- the equivalent of more than three million servings." In addition, "the 'Great Gallon Give' will also make it possible to help families in need by passing a virtual gallon of milk to friends on Facebook (Facebook.com/MilkMustache). For every virtual gallon passed, $1 will go to Feeding America, up to $100,000." We'll drink (milk) to that. When actress, mom and "Dancing With the Stars" hot stepper Melissa Joan Hart plans a birthday party for one of her sons, you know she has a ton of options to choose from. After all, what Hollywood mom doesn't have the 411 on the best birthday spots around town? Lucky for her eldest son, Mason, who just turned 4, party headquarters was at one of his favorite places this side of Disneyland -- his mom's own sweets shop, Sweetharts in Sherman Oaks. And lucky for me, I got to be a fly on the wall for the festivities. Not only did I get to chat with Melissa about her family and Sweetharts for a second time, but she also gave me some great travel tips (they flew in from the East Coast) and a heads up about a pilot she just shot with Joey Lawrence called "Melissa & Joey." But more on that later. "I have to juggle," Melissa said about party planning, as children flitted around her, waving candy and balloon animals. "Luckily, my mom's here" and husband Mark Wilkerson, she added. "It takes a village." I could certainly relate as I watched her gently pull her younger son, Brady, away from a jar full of chocolate candy. That was while also greeting guests (including Joey & family, actress Kellie Martin & family), filling goodie bags and coordinating with her party planner. It does take a village -- and maybe a little caffeine and sugar, too. You'd think that she'd be frantic, but no. Totally calm and in control. If you've never been to Sweetharts (pictured above), it's a child's wonderland of gelato, frozen yogurt, jars upon jars of candy bars, baked goods and, thank God, coffee. According to the shop's designer Lonni Paul (who was also featured on HGTV's latest "Design Star" alongside new business partner Dan Vickery), "Melissa really had a vision." "We wanted to make it kind of fun and whimsical," she said. 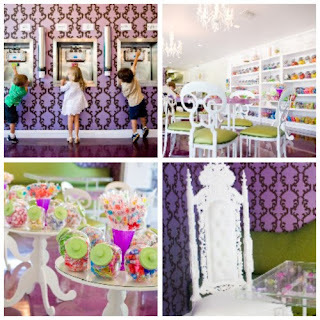 "The shop is decorated in a modern baroque style with funky chairs, purples and greens," as well as mod white chandeliers and translucent cafe tables designed by Lonni with candy treats suspended inside. It's a place you might imagine Willy Wonka's younger, more socially adept sister would run. Birthday celebrations include a party planner who can arrange face-painting, balloons and a jumpie outside, according to Melissa. "She gets things done and makes sure everything stays clean," she added. And not only can kids partake of the goodies inside Sweetharts, but they can also make their own pizzas and have them baked at Vitello's Pizza next door. All of that in addition to make-your-own cupcakes, and the kids were in sugar-coated heaven. Through it all, Melissa was the queen of calm, and you could see that she was having a lot of fun herself. I asked her how it was flying from their new home on the East Coast and if she had any travel tips for taking kids on long flights. "Each of the boys has a rolling backpack filled with diapers, toys, tricks and snacks," Melissa said. "My favorite -- they have iPod touches with really low gigs. They have songs, games -- they like to play the Itsy Bitsy Spider game, Frogger -- and movies." "Traveling is really difficult," Melissa added, mentioning not only logistics but also missing out on seeing friends like BFF Kellie Martin. And she might be traveling a lot more depending on how her pilot "Melissa & Joey" shakes out. In the show, Melissa stars as a woman who's taking care of her sister's kids when out-of-luck Wall Streeter Joey arrives and offers to help around the house. "It's a romantic comedy," Joey Lawrence said about the show. "It's like 'Mad About You' on its head." Joey was at the birthday party with his wife, 3 1/2-year-old daughter Charli and daughter to be. "My wife is due in 6 1/2 weeks," he said. "It's another girl." He's certainly had some practice. He was practically glowing when talking about Charli. "We do everything together," he said. "She loves movies, the theater -- we saw 'The Grinch' and 'Mary Poppins.' I also took her to 'Avatar' in 3-D Imax. She loved it, she was grabbing at the screen." The party looked like a giant success. It was truly lovely watching the birthday boy hug each of his friends when they arrived and seeing his younger brother playing peek-a-boo through some of his balloon animals. The bubbles that floated down from the Sweetharts rooftop was a nice touch. In fact ... I might have to start thinking about reservations for next December. Sometimes it's nice just to have a little reading time -- albeit at the gorgeously outfitted Children's Literature Department at the Central Library downtown. I had my own books to check out, but CC and I made our first stop in the seemingly endless tyke-centric section that houses everything from Dr. Seuss to Spanish-language materials to J.K. Rowling. Considered a "library within a library," according to the Los Angeles Public Library Web site, the area boasts a collection of 250,000 books in addition to other multimedia elements including a computer zone. There's even a story-time area with tiered seating and stuffed animals. Speaking of story time, the next pre-school group will meet Tuesday, Jan. 12, from 11-11:30 a.m.
Be warned: You might have a hard time getting your child to leave. 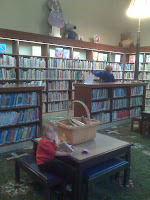 It took some major effort and a lot of cajoling for CC to allow me to visit the "mommy books." No tears, but almost. Although .... I guess there could be worse things than your child demanding to read more "baby books." Parking: Enter on Flower Street, and remember to get your ticket validated. 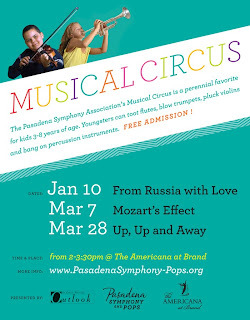 Tykes can get their groove on this weekend at The Americana at Brand in Glendale, as the Pasadena Symphony Association hosts Musical Circus on Sunday, Jan. 10. The free, Russo-themed event, from 2-3:30 p.m., looks like a lot of fun for kids ages 3-8. Children can explore musical instruments, including flutes, trumpets and violins. For more information, visit: www.PasadenaSymphony-Pops.org. If you and your kids didn't get enough snow this holiday season, head over to Culver City's Veterans' Memorial Park on Saturday, Jan. 9, for a Winter Wonderland and Playground Celebration. Beginning at 10 a.m., the event will kick off with a ribbon-cutting ceremony to honor the new Vets' Park Playground. According to the city's Web site, "Tons of snow will transform the landscape into a wintry play area." 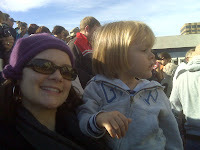 Please check out my fellow Silicon Valley Moms Group (parent of LA Moms Blog) bloggers for our Best of 2009 posts. I chose "How Camp Snoopy Almost Killed Me" as my fave post of the year. There are lots of fun and poignant stories from great moms all over the country. Take a look when you get a chance! And Happy 2010! You might remember back in November when we attended Electronic Arts' Winter Wonderland and CC went crazy over the video-game company's "Littlest Pet Shop Friends." After I played Wii tennis for way too long and stretched muscles I didn't even know I had -- yes, folks, from a video game -- we popped in the kid-centric "Pet Shop" to see if CC would even remember it. 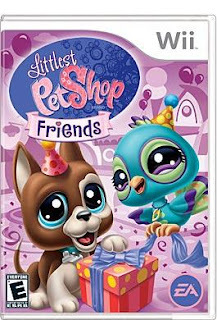 "Littlest Pet Shop Friends" is an adorable game filled with wide-eyed little creatures who are eager to throw a surprise party for a fellow pet -- one that's hiding in a cocoon and thereby confusing her BFF, little Bear. While planning the party, the animals take detours around the city and country to play games, bake cakes and buy party accessories. CC's fave hangout is the Ice Cream Paw-lor, where players can make ice-cream cones based on a pet's request. The more points you earn in these games, the more kibble coins you score to buy fun pet fashion items such as sunglasses or collars. The game itself is easy to play, but you have to be able to read if you plan to play alone. For a 3-year-old like CC, that part is hard -- in addition to just navigating the Wii controller as a beginner. But, at this age, she's also not going to grab a sippy cup and pop in the disc on her own, anyway. If she wants to play, we're always around to help her out. "Littlest Pet Shop Friends" is cute and fun and new -- and something CC now wants to play every morning when she wakes up. She might not risk getting tennis elbow, but I definitely don't want her to overdo it. Moderation, even with adorable video-game pets, is always important. 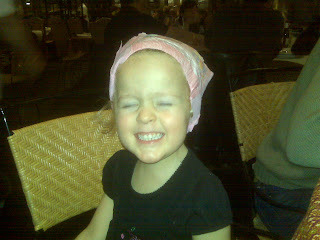 Yes, this is my daughter with a Huggies Pull-Up on her head. In public. At a restaurant -- Saladang Song in Pasadena, to be exact. As much as I love this photo -- it captures her attitude about the whole thing perfectly -- I regret not snapping a pic while she was peering out at me through one of the leg holes. That would've been a keeper. I post this only to let other parents out there know that I am now part of that elite club of mortified yet sanguine adults who watches as their child digs into that lead weight of a diaper bag you drag around everywhere, finds a perfectly clean Pull-Up, has the inspiration to don it as head gear, laughs at you through one of the openings where an appendage should be, and then revels in a victory dance that involves random strangers who had hoped to enjoy a quiet meal. And your only thought while all of this is happening: Thank God she's not screaming! 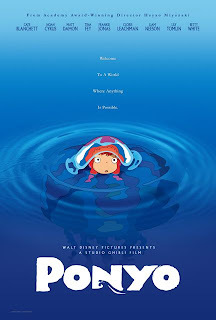 When Ian and I took CC to see the American theatrical release of Japanese animated film "Ponyo" in Santa Monica this summer, I had no idea that we were creating a devoted fan. Who knew Japanese anime was my toddler daughter's thing? Before "Ponyo," none of us had seen a film by animator/director Hayao Miyazaki, and I wasn't sure what to expect. Too much fantasy? Overly mature themes? Despite being dubbed into English with voices including Tina Fey and Matt Damon, would something simply be lost in translation? No, no and no. "Ponyo," the story of a literal fish out of water, was lovely and captivating and dreamlike -- and something CC kept talking about for months after it had left the theater. In fact, whenever we'd stroll along the Third Street Promenade, she'd point to the very same theater and say, "Ponyo!" Even in the bathtub CC would splash around, yelling, "Ponyo! Ponyo!" I'm convinced that's because she somehow identified with the plucky goldfish who flees her underwater life to become a little girl. So, of course, I wanted to investigate more of Miyazaki's work. 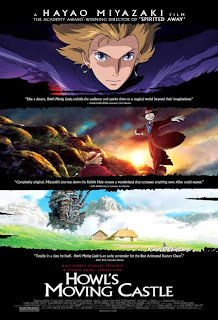 Last week, "Howl's Moving Castle" arrived via Netflix, and I was curious to see how CC would like it. Heck, how I'd like it. Whereas "Ponyo's" main characters are children -- and their parents -- "Howl's" protagonist is Sophie, a teenage girl who falls in love with a magical, parentless, wandering loner. CC was captivated. She liked Sophie instantly and wondered what had become of her when she was changed into an old woman by a curse. We did have to take a small break just before the end, but otherwise CC was riveted, asking questions and talking to the screen -- mostly to the charmingly grumpy fire demon voiced by Billy Crystal. Of course, she couldn't possibly understand some of the themes, such as government rebellion or romantic love, but she enjoyed the animation as well as Sophie, yet another plucky girl who's determined to venture into an unknown world to find what she needs -- in this case, a way to lift a curse. And that's something I enjoyed about the two Miyazaki films -- watching two strong, independent young girls discovering themselves through trial and error, both willing to take a chance on something that seems ludicrous yet still attainable. Now, has anyone seen "Spirited Away"? Because that one's next. Please check out my latest LA Moms Blog post, "Helicopter Parent Hits Some Turbulence." If you didn't catch the Time magazine article "Helicopter Parents: The Backlash Against Overparenting," I happened to read it just before CC took a tumble and had to visit the emergency room. And I had been "hovering" a mere 10 feet away from her. It's a struggle to know when you're hovering too closely, but I'm hoping I won't really have to worry about it until I'm contemplating moving next door to her college dorm. 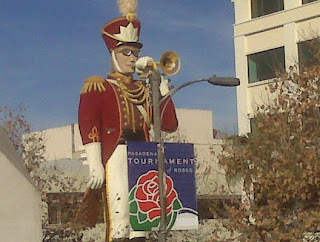 When my friend Laura arrived from Georgia and said she had an extra ticket to the Tournament of Roses Parade in Pasadena and asked if I would like to bring CC, I jumped at the chance. I mean, bringing a toddler to an hours-long parade where we would have to wake up at the crack of crack, sit thisclose to our neighbor and pray that we wouldn't need to get up, much less use the porta-loo, seemed a little like the fifth circle of hell. But I was wrong. I brought my little dynamo to the parade, and she was great. Not only did she sit on my lap and Laura's lap (left) the entire time, but she did so without whining, crying, screaming or trying to leap off the bleachers and onto the Shanghai appreciation float. CC was engaged and genuinely interested in marching bands from Missouri, Ohio and even Tokyo. She loved the floats -- particularly the one with the wizard and the origami dragon -- and waited patiently when there was a pause in the action. I know it's always a gamble when you bring a small child to a crowded, noisy event, but this was a unique opportunity -- perhaps once in a decade or even a lifetime -- and I didn't want her to miss it. I'm glad we were there, huddling together over juice, frosted animal crackers and Starbucks. If you didn't get a chance to hit the parade, the floats are on display today from 9 a.m.-5 p.m. on Sierra Madre and Washington Boulevards in Pasadena. Admission is $7 and free for children ages 5 and under. Hope you had a happy and wonderful start to the New Year! 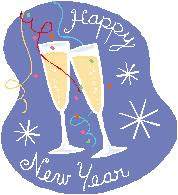 Best wishes for a great 2010! I'm looking forward to chronicling more L.A. adventures with CC, so stay tuned.